Evie Dexter's job as tour guide takes her to faraway destinations, from the romantic island of Venice to the rising temperatures of Marrakech. The vivid descriptions of the exotic cities she visits makes them sound ever so inviting to the reader. Upon first glance Evie's life seems quite perfect. However, her fiancé Rob (who cheated on her, though she has been able to forgive him his momentary judgement lapse) is slowly becoming more controlling as he first asks her to quit her second job, and then even suggests that she should stop touring as well. With the exception of the tours for which he can be assigned the driver, as they'll be together for those. While I haven't read the first title in the series, It Happened in Paris, it was easy to get into this novel and be swept away by Evie's escapades and the vivid descriptions of all the places she gets to visit as a tour guide. As a seasoned traveller myself it was nice to be able to revisit cities I've been to in the past and also discover new exotic destinations that sounded so appealing that I wanted nothing more than book myself onto the next plane able to take me there. And in between the detailed descriptions of the holiday destinations there is the solid story of Evie's turbulent romantic life and the crazy situations she often finds herself in. With an outgoing and bubbly personality, which seeps through the pages of the novel and defines its flirtatious tone, it's hard not to instantly fall in love with her. However, despite Evie's fun-loving nature she was as a main protagonist quite weak. Throughout the novel I was hoping she would grow a backbone as she rarely (or ever, really) makes any important decisions for herself, but instead goes along with whatever the men in her life (Rob, John, Nikki) tell her to do. Had she been stronger I would've probably sympathised with her more. The other characters were mostly well-written and provided a colourful background; rich and handsome business man John, Evie's temperamental boss Nikki (and his hilarious mother) and her best friend Lulu (who has an on and off relationship with her nicotine addiction), are the most prominent ones. Author Molly Hopkins managed to make them all very likeable and it quickly felt like I had known them for years. John in particular was well-rounded, and in fact I wish I had known him for years! I mean, who wouldn't want to be swept of their feet by this handsome man and fly away in his private jet? My point exactly. 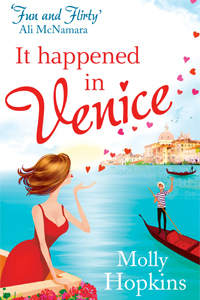 In short: It Happened in Venice is a quick and fun Summer read. Those who enjoy books from the likes of Sophie Kinsella and Lindsey Kelk will particularly enjoy reading about the adventures of Evie Dexter. Thrown in a healthy mix of eccentric friends and family members and, of course, available bachelors, and you've got yourself a fab chick-lit read to dream away with. Many thanks to Sphere for a copy of the novel in exchange for an honest review!